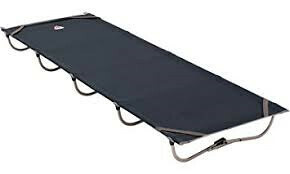 Just wondering what experience or opinions members have of camp beds? Positive or negative..all views welcome. I was given a Thermarest Cot, thanks to a prize through this very website. Its a really comfortable bed, and has added a lot of luxury to my canoe camping. However, it is ridiculously expensive to buy, and a bit of a faff. Its much lighter and smaller than traditional camp beds though. There is a Far East copy that I've seen (link may not be exact same model), that others have got, that seems to do exactly the same job, but for much less money. Does anyone know where to get the new Yahill model, to which Mel refers, in the UK? I can only find it via Amazon in the USA and there are significant shipping charges. Still makes it cheaper than the Thermarest version, but not by much. If the works just found similar for £32 on amazon uk. If weight isn't an issue the Kampa slumber "PLUS" is wider than normal and with a nice wide self inflating mat on, its a real comfortable sleep. Last edited by terry. young; 7th-February-2019 at 05:18 PM. Thanks for the advice guys. The Amazon link covers the original model rather than the new design. The new one has different feet - there was some concern about the fragility of the original ones - and I think takes a higher weight! I am quite a big bloke! I will look at the other ideas too. Sorry, just grabbed a link on the phone. I know that Stewart of this site bought one in the last year or so, in the UK, maybe he'll notice this, or you could PM him. Many thanks Sirus. Looks like more gear on the way for me and a new season to look forward to. I have one with the round feet and crossbars and it's really comfortable. There are a few on the market and I'm sure I didn't pay more than about £35. I guess it's not as good as the market leaders but it is quite serviceable. You do need to be sensible getting on and off, transfer your weight straight to the middle and don't sit on the edge or it will bend. Seen but not tried Adrian's (above) but heard his enthusiasm first hand!! I have one, the circle and bar system from LESHP (like Yahill) via Amazon and it works very well. I agree with Adrian that you need to be careful mounting and unmounting but once on it is very comfortable. I used it in very warm conditions to ensure I had a flow of air - mini hammock! I have an exped megamat10. Its not a campbed but it is 10cm thick so near enough. Its stupidly warm and comfortable. Its 195cm long by 76 wide so not small either. The model that I have is no longer available but it may be worth considering the current ones? A belated thanks to Grebby for suggesting a thicker sleeping mat rather than a camp bed. The Exped gear looks great but is in the Thermarest Cot league in terms of price. But that thought led me to an Alpkit Dozer. Alpkit have a lovely shop in Hathersage so I was able to test one out on the shop floor! At 7cm , it’s twice the thickness of my Thermarest and seems remarkably comfy. The price -£59- seemed remarkable too. It’s a good length as well which may suit big yellow tractor. I have a Go Lite Shangri La tent and I was a little concerned that some camp beds would be too high and I would be at risk of touching the inner tent. A thicker sleeping pad seems a good compromise. we shall see when I test it properly on the Wye in early April. Can’t wait. Thanks for all the helpful advice and pointers. They are a bit spendy. That said it's a pay once cry once thing. Well twice in my case as my wife then "needed" one as well. The Helinox bed is a longer thinner pack size, excellent quality, lighter and also easy to assemble but silly money, however money well spent if you have a back like mine. Whilst they both keep you off the ground I use a cheap foil insulating mattress underneath the bed (but on top of the legs) which works very well. Last edited by mayobren; 1st-March-2019 at 06:40 PM.